3. Sit the bowl over a pan of gently simmering water and stir until the custard becomes thick enough to coat the back of a wooden spoon. 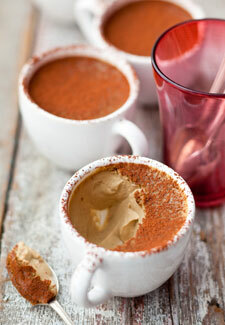 Pour into individual espresso cups, dust with cocoa powder and serve immediately! Serve with a slice of delicious chocolate torte – you can’t go wrong!